GOODNESS FROM JAPAN, AND ONE AMAZING CUSTOM! So, it looks like 2010 is definitely shaping up to be a great year for Jurassic Park collectors! Forum member Rabidrex recently posted some info about the Revoltech Expo in Japan, where well-known Japanese brand Kaiyodo revealed their 2010 line-up. And yup, a T-Rex from Jurassic Park is among these new toys! For all the people who have wanted a well-articulated T-Rex for year, look no further, this one is gonna deliver. The only "downside" is its size: approximately 2.5" tall and about 6" long head to tail. But still, it's going to be a great piece of collectible to own. Check this link for a good view of the T-Rex prototype! 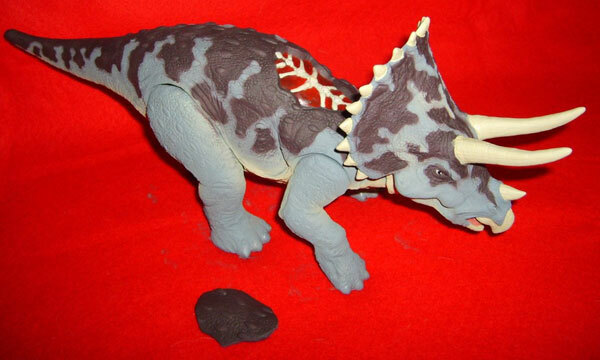 In other news, forum member Quetzalcoatlus, well known on our forums for the amazing customs made by a friend of his, Roberto, showed us the latest creation of his buddy: a custom of the unreleased TLW series 2 Triceratops! And boy, is this custom drool-worthy! And it also features removable dino-damage piece, and movable legs! Indeed, one awesome piece to own. You can see more pictures of this gem in Quetzalcoatlus' thread on the forums. Enjoy!